Karen Bulmer is a versatile tuba player, educator, writer, and podcaster. 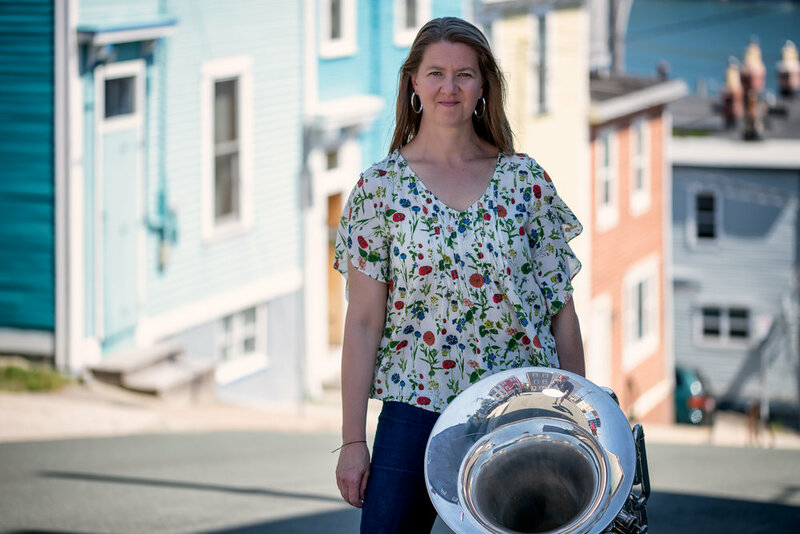 She is active as a tuba soloist and improviser and has performed her original one-woman show, Girl Meets Tuba, which chronicles her on-again off-again relationship with the tuba, in venues across Canada. Karen holds a Bachelor of Musical Arts from the University of Western Ontario, a Professional Studies Diploma from the HARID Conservatory, and both a Master of Music and Doctor of Musical Arts from Yale University. Karen trained in meditation facilitation under the mentorship of Michael Stone and is a certified yoga instructor with additional training in biomechanics, anatomy, and movement for trauma. Following three successful seasons (1996-1999) as Acting Principal Trumpet of the National Arts Centre Orchestra of Canada, Karen Donnelly was unanimously appointed Principal Trumpet in October 1999, and continues to enjoy each year with this wonderful ensemble. A native of Regina, Saskatchewan, Karen started the trumpet in her elementary school, an active high school band program propelled her into a Bachelor of Arts in Music program at the University of Regina. Her education continued at McGill University where she completed a Master of Music in 1991. Freelancing in Montreal, she quickly became one of the most sought-after trumpet players in the area performing many concerts with the Orchestre Symphonique de Montréal. Since arriving in Ottawa in 1996, Ms. Donnelly has participated in concerts and interviews for CBC (French and English), performances with the Ottawa Chamber Music Festival, Rideau Lakes Brass Quintet, and the large ensemble, Capital BrassWorks. In 2008, Capital Brass Works released its third album, “Gabriel’s Sister” featuring Ms. Donnelly as soloist. Karen has been featured with professional orchestras, community amateur orchestras, and many local school bands. These include Thirteen Strings Chamber Orchestra, Kington Symphony, Saskatoon Symphony Orchestra, Orchestra London, McGill Symphony Orchestra, Hannaford Silver Street Band, Maple Leaf Brass Band, Parkdale Orchestra and the Regina Catholic Schools Honour Band. Music education has always been, and continues to be, very close to Karen’s heart. She has given master classes and workshops in Switzerland, Mexico, China, United States, United Kingdom and Canada from coast to coast. Ms. Donnelly joined the teaching staff at the University of Ottawa in 2002, and since 2009, Karen has been assisting with the Leadingnote “Orchkidstra” program, the local ‘El Sistema’ inspired program. While influenced by so many great musicians, Karen has been very fortunate to study with James Thompson, Robert Earley, Barbara Butler, Michael Sachs, Phil Smith and the late Mr. Arnold Jacob and Vincent Chicowicz. And of course her first trumpet teacher Dr. Ed Lewis who helped keep the trumpet in her hands. 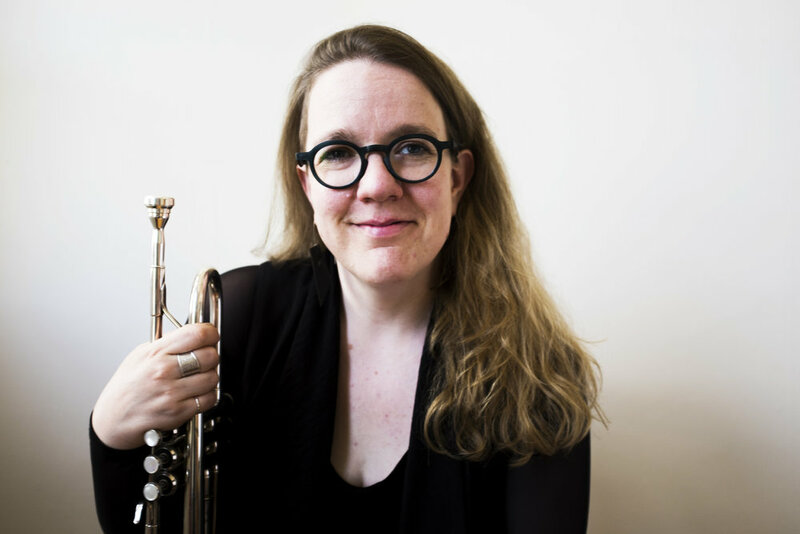 Megan Hodge is an active freelancer on tenor and bass trombone, and has made Toronto her home for the past fourteen years. Originally from Edmonton, Alberta, Megan studied at the Glenn Gould School and McGill University. She performs regularly with the Toronto Symphony Orchestra, the Canadian Opera Company, the Esprit Orchestra, The National Ballet of Canada Orchestra, and the Hamilton Philharmonic, and is a founding member of the Toronto Brass Quintet. She has also held positions as Principal Trombone with the Victoria Symphony and as a trombonist in The Royal Canadian Artillery Band with the Canadian Armed Forces. She is the Director of Music for the Regimental Band of the Queen’s Own Rifles of Canada where she conducts and leads a 35 piece military band. As a teacher, Megan is on faculty at the University of Toronto where she instructs trombone and orchestral studies. Amy Horvey is inspired to wear many hats as a 21st century trumpet player. She is active as a creator/interpreter of new and experimental music, as a performer of modern orchestral music, and as a researcher of the baroque trumpet. A champion of Canadian contemporary music, she has performed with Nouvel Ensemble Moderne and Arraymusic and has commissioned works by Nicole Lizee, Cassandra Miller, and Christopher Butterfield, among many others. She has recorded three albums – Interview, Catchment, and Mille Bayous. As guest director of the Montreal ensemble Novarumori she led Still Listening : a Tribute to Pauline Oliveros at the 2017 Suoni per Popolo Festival. Her solo projects have been featured in festivals across Canada, and in the Netherlands, Lithuania, Italy, and the US. On the orchestral stage, Horvey has appeared as a soloist with the Montreal Symphony Orchestra and the National Arts Center Orchestra, in whose trumpet sections she also regularly plays, working with many of the world’s greatest conductors including Pierre Boulez, Zubin Mehta, and Roger Norrington. Her research and experimentation with early instruments has resulted in performances with Arion Baroque Orchestra, Ensemble Caprice, Studio de musique ancienne de Montréal, and Les Violons du Roy. Canadian Trumpeter Merrie Klazek is active as a performer, teacher and recording artist in orchestral, chamber, solo, traditional and popular music. She holds a Bachelor of Music with distinction from her native Calgary, and an Master of Music, Pi Kappa Lamba from Northwestern University where she studied with the late Vincent Cichowicz. Her musical travels have taken her around the globe with performance highlights including the Spoleto Festival Italy, Musik Contemporaire Strasbourg France, Tokyo's Bunka Kaikan hall, Stratford Festival, Hungary's Niyrbator Festival, the International Trumpet Guild Conference, and the International Women’s Brass Conference. Ms. Klazek has appeared as a soloist with a variety of Canadian orchestras and ensembles. She has been the principal trumpet with the Thunder Bay Symphony, since 1999 and has held the same position with the Victoria Symphony (2005/06) and Orchestra London Canada (1996-99.) She has performed in the trumpet sections of Canada's top orchestras and spent 14 years on faculty at Lakehead University in Thunder Bay. In 2016 Ms. Klazek joined the full-time faculty at the University of Victoria’s School of Music, as Professor of Trumpet. Her teaching philosophy has its foundations in the Arnold Jacobs’ school of Wind and Song. As a chamber musician Ms. Klazek is a founding member of Brass Northwest in Thunder Bay, and currently also plays with Pinnacle Brass Quintet on the west coast. Ms. Klazek’s solo recording entitled “Songs to the Moon” has been featured on TVO Studio 2 and on CBC Radio. She appears on numerous other recordings including four JUNO nominated albums, and is currently working on her second solo recording, which will highlight the trumpet in settings of various world styles in collaboration with renowned folk musicians. Vivian Lee was born and raised in Montreal and did most of her university studies at McGill University and L'université de Montréal. She began her career as a freelance musician in the early 1980’s, and, amongst other gigs, made her OSM debut in the off-stage brass ensemble for Mahler’s 8th symphony at the Montreal Forum. 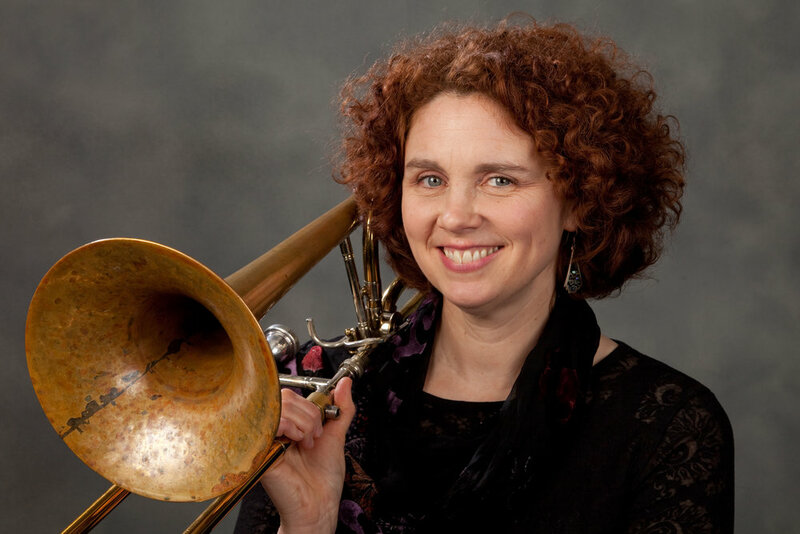 She moved to London, Ontario in 1986 with her baby daughter, Erica, and husband, David Martin, (also a noted trombonist and teacher), after he won the position of principal trombone with Orchestra London, Canada. In 1987 Vivian won the position of second trombone with the Hamilton Philharmonic. In 1990, she moved her family (by then another child, Travis, had been added) back to Montreal after winning an audition for a one-year position as second trombone with the OSM, subsequently winning a permanent position in 1992. Beyond participating in all the OSM activities during the subsequent 26 seasons, she has played as a soloist and chamber musician at International Trombone Festivals, and as a chamber musician at the Women’s Brass Conference as well as giving several master classes and teaching trombone both at McGill University for several years, and privately. Gillian MacKay is Professor of Music of the University of Toronto, where she conducts the Wind Ensemble and teaches conducting. Gillian has an active professional career as a conductor, adjudicator, clinician and trumpeter. She has conducted honour ensembles throughout Canada and the United States, and is Associate Conductor of the Denis Wick Canadian Wind Orchestra. Dr. MacKay has adjudicated Canadian band festivals at local, provincial, and national levels in Canada. She has conducted honour bands and judged competitions in the US, Singapore, Thailand, and Korea. Dr. MacKay enjoys presenting clinics and workshops at provincial and state conferences in Canada and the United States, and is known for her work on the relationship between conducting and mime. Currently, she is investigating the application of the Michael Chekhov acting technique to movement and meaning in conducting. Recognized as a conducting pedagogue, Gillian leads the University of Toronto Wind Conducting Symposium each July, and has been the guest instructor at other symposia in Canada and the United States. Gillian holds degrees and diplomas from the University of Lethbridge, McGill University, the University of Calgary, and Northwestern University. Originally from West Chester, Ohio, Catherine Turner has been the Second Horn of the Orchestre Symphonique de Montréal since 2010. Before joining the OSM, she held the position of Fourth Horn in the San Antonio Symphony and Assistant Principal Horn in The Florida Orchestra. In addition, she has performed as guest Associate Principal with the Cincinnati Symphony, has toured and recorded as Principal Horn with the Manitoba Chamber Orchestra, and has performed with numerous other groups, including the Richmond Symphony, the Sarasota Orchestra, and the San Antonio Opera. Catherine began her studies with Greg Snyder and Karen Schneider, before attending Rice University’s Shepherd School of Music, where she was a student of William VerMeulen. Her studies have also taken her to many summer programs, including the Tanglewood Music Center and the Aspen Music Festival, where she studied with John Zirbel and was the winner of the Brass and Percussion Concerto Competition in 2009. Catherine has been featured in solo recitals at the University of Akron and Colorado State University, and in 2014 she was the winner of the Horn Division of the Susan Slaughter Solo Competition at the International Women’s Brass Conference. 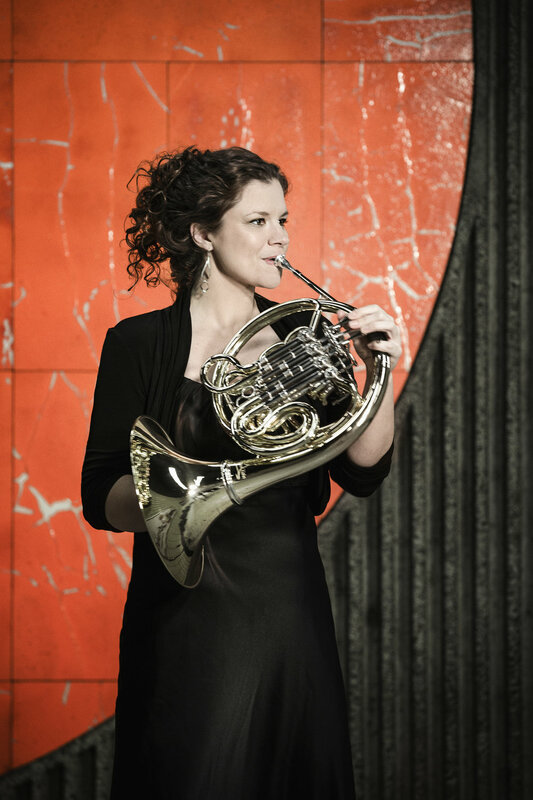 She has been a featured soloist on Public Radio International’s “From the Top,” and has also performed internationally as a soloist, giving both the U.S. and European premieres of Brant Karrick’s “Taranto Reflections” for Horn and Wind Symphony. 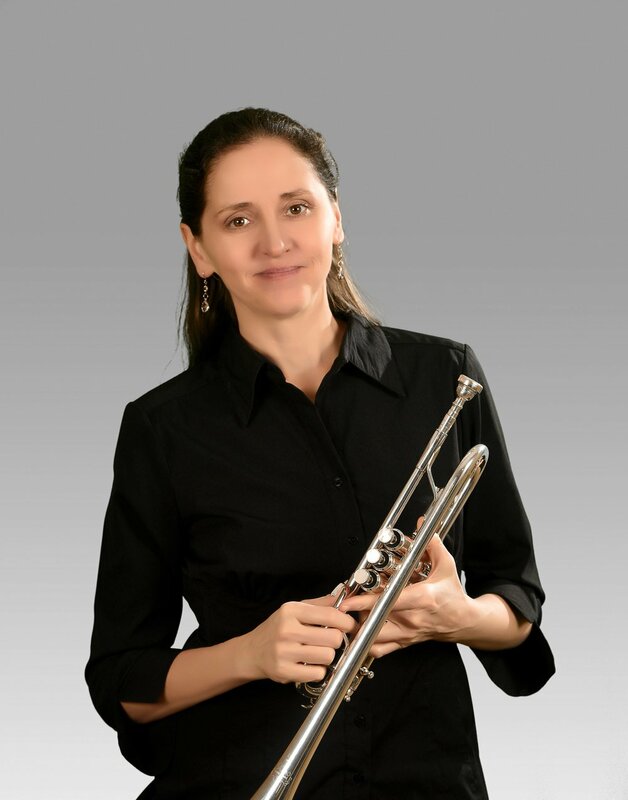 She has also given masterclasses at the University of Akron, Colorado State University, the University of Montreal, and Montreal Horn Day, and she is currently an instructor of horn at McGill University. Since her appointment with the OSM, she has performed internationally in the orchestra on major tours in North and South America, Europe, and Asia. She can be heard on the OSM’s recent recordings of Beethoven’s Symphonies and Mahler’s Orchesterlieder.